Kate Middleton’s maternity style statements are still causing an internet storm, despite the fact she’s only been seen twice since giving birth to Prince George last week. Following the news that Jenny Packham’s website crashed under demand for the Duchess of Cambridge‘s bespoke blue polka dot creation – and the fact that Prince George’s first baby shawl also sold out online – the dress that the royal wore in transit from Kensington Palace has now attracted a waiting list. When Kate, Prince William and baby Prince George set off for the Middleton family home in Bucklebury last week, the royals were photographed through the windows of their 4×4. As the glowing Duchess waved happily to passers-by and well-wishers, she revealed a sneak peek of her second post-baby outfit, a blue floral wrap dress from British maternity brand, Seraphine. Cue hysteria. 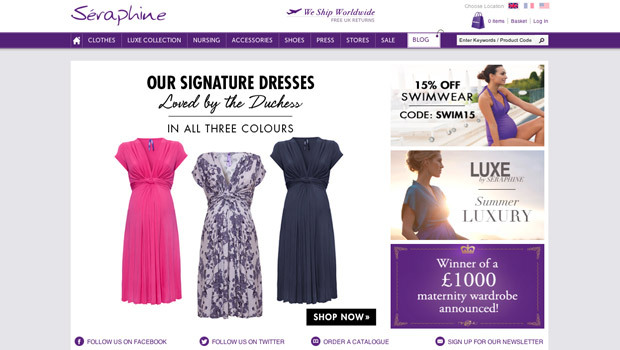 The website describes the dress like this: ‘This chic short sleeved maternity dress is the ultimate in effortless style and will ensure that you are perfectly polished for the on the go style in minutes. The lavender floral print follows on from this season’s penchant for bold designs in a purple palette making it trouble free to work the aesthetic. While the dress is available in two other colours, both of those have also sold out – and there’s now a month-long waiting list for the style. 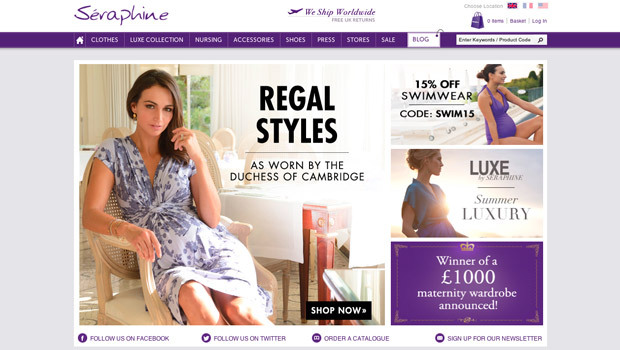 Kate Middleton has been a fan of the brand throughout her pregnancy. She was previously spotted wearing Seraphine’s polka dot Renata Dress and the white Colette Maxi Skirt. She ordered over a dozen designs from the brand’s two West London boutiques – one of which is conveniently located on Kensington Church Street, near Kate‘s new home of Kensington Palace.